It has been well said that Christ’s RESURRECTION is the Father’s “AMEN” to His Son’s declaration “IT IS FINISHED.” Looking at the Cross we see the work of redemption completed. Looking at the open tomb we see Jesus’ finished work fully accepted by the Father. The payment required for sin is death (cf Ge 2:17–note, Ro 5:12–note, Ro 6:23–note) and when Christ said TETELESTAI, He was saying that the sin debt was “PAID IN FULL!” If you believe that dear reader, His righteousness has been credited to your account (Ro 4:3–note, Ro 4:24–note, Gal 3:6-7–note). We owed a debt we could never pay. Jesus paid a debt He did not owe! Tony Evans says “All the funds necessary to pay for our total redemption were put up by Jesus Christ on the Cross.” Or as Warren Wiersbe put it “He took my bankruptcy and covered it with His solvency.” He didn’t just make a down payment and then expect me to keep up the installments. “But now he has appeared once for all at the end of the ages to do away with sin by the sacrifice of Himself” (Hebrews 9:26–note). His empty tomb and His resurrection are indisputable testimony to the fact that the Father accepted His Son’s payment for sin on our behalf, as our Substitute. Thus TETELESTAI is not a cry of defeat of a dying Man, but a cry of triumph of a Living, Life Giving Redeemer, a divine proclamation that the WORK OF REDEMPTION had been fully, finally and forever accomplished (cf Jn 4:34–note, Jn 17:4–note). THE PERFECT TENSE: TETELESTAI is in the perfect tense which describes a PAST completed act with PRESENT effect, emphasizing that the past completed event of Christ’s death on the Cross has ongoing, even permanent effects. Jesus’ sacrifice may have occurred in time and space, but its results will last for eternity! 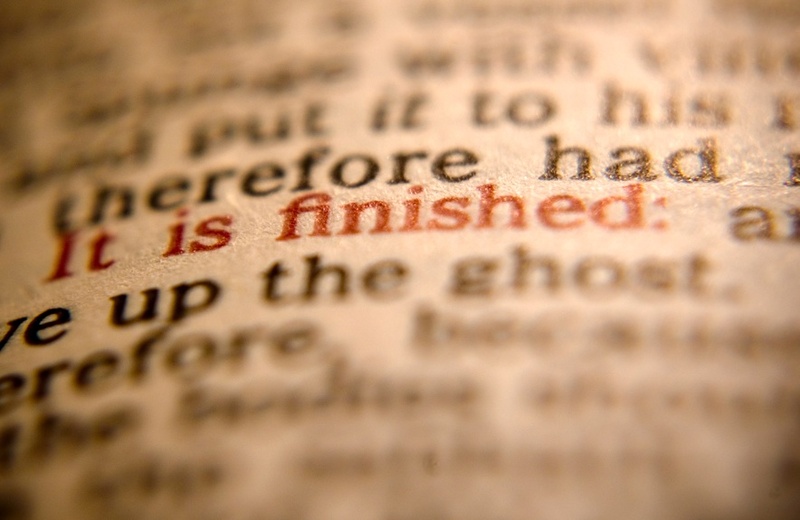 In other words, when Jesus declared “IT IS FINISHED”, He was saying that His mission to redeem sinners had reached its intended goal and that the benefits to the redeemed would last throughout eternity. Erwin Lutzer adds that “This means that my sins are on Jesus, not on me. Yes, there is sin within me but not on me. My sinful nature keeps luring me toward sin, and even in my best moments my works are tainted with selfish motives. But legally, I am accepted on the basis of the merit of Jesus. Figuratively speaking, I have a new set of clothes and a clear record in heaven. The righteousness of Jesus has been (forever) credited to my account.” All that truth in one Greek tense! Beloved our Redeemer’s ransom payment is sufficient for this life and the life to come! May God enable us by His Spirit, to live victoriously in light of the truth of this “Word of the Cross” (especially the great word “tetelestai”) which is the “power of God” to us “who are being saved (daily by the Spirit)” (1Cor 1:18–note). Frank Boreham writes that “When the painter or the sculptor had put the last finishing touches to the vivid landscape or the marble bust, he would stand back a few feet to admire his masterpiece, and, seeing in it nothing that called for correction or improvement, would murmur fondly, ‘Tetelestai!’ ‘Tetelestai!’” “IT IS FINISHED!” All the Old Testament “pictures” (types) of Messiah were fulfilled in Christ and were only a “shadow of what is to come; but the substance (reality) belongs to Christ.” (Col 2:17–note). The death of Jesus on the Cross “finished the picture” of redemption, a masterpiece which had been in the Father’s heart “from before the foundation of the world” (1Pe 1:20–note, 2Ti 1:9–note). In ancient times when a promissory note was paid, the one holding the note wrote “TETELESTAI” across it. A deed to property was not in effect until it was dated and signed, and when this was accomplished, the clerk wrote “TETELESTAI” across the deed. When someone had a debt and it was paid off, the creditor would write “TETELESTAI” on the certificate of debt signifying that it was “PAID IN FULL”. It is reported in several secondary sources that several years ago, archaeologists digging in Egypt uncovered the “office” of an ancient “CPA.” In this office they found a stack of bills, with the Greek word “tetelestai” inscribed across each bill – “Paid in full“! (See next paragraph which gives historical support for the interpretation of tetelestai as “paid in full.) When Christ gave Himself on the Cross, He fulfilled all the righteous demands of the law and our “sin debt” was PAID IN FULL. The OT sacrifices covered sin but could never take sin away. Jesus accomplished what all of the old covenant sacrifices could not do. “In eternity the Son gave the Father a “promissory note” that He would pay the price for humanity’s redemption (see Heb 10:5–7–note). On Calvary the note was PAID IN FULL. TETELESTAI!” (H H Hobbs) As Spurgeon said “There is no mortgage on the saints.” Wayne Grudem adds that “If Christ had not paid the full penalty, there would still be condemnation left for us. But since he has paid the full penalty that is due to us, “There is therefore now no condemnation for those who are in Christ Jesus” (Ro 8:1–note). This ancient manuscript substantiates that tetelestai was occasionally used to mean “paid in full” in secular (commercial) settings. (5) PRISONERS: FYI – While the following illustration of Tetelestai is “attractive” and sounds Biblically reasonable, I have been unable to document that this description was the actual practice in Roman prisons. Therefore one might want to either ignore this illustration or use it as an illustration but with a qualifying explanation. The esteemed pastor Adrian Rogers used this illustration in at least five messages, but unfortunately he did not reference a specific resource. “We need not fear that either sin or Satan or law shall condemn us at the last day. We may lean back on the thought, that we have a Savior Who has done all, paid all, accomplished all, performed all that is necessary for our salvation. We may take up the challenge of the Apostle, “Who is the one who condemns? (cf Ro 8:1–note) Christ Jesus is He Who died, yes, rather Who was raised, Who is at the right hand of God; Who also (continually) intercedes for us.” (Ro 8:34–note). When we look at our own works, we may well feel ashamed of their imperfections. But when we look at the FINISHED WORK of Christ, we may feel peace (cf Heb 12:2–note).” Hallelujah! This is exactly what the great missionary Hudson Taylor, founder of China Inland Mission, did as he meditated on “IT IS FINISHED” writing that “There dawned upon me the joyous conviction that since the whole work was finished and the whole debt was paid upon the Cross there was nothing for me to do but to fall upon my knees, accept the Savior and praise Him forevermore.” Amen! And since the work of redemption is finished by and in Christ, now based on the fact that we are God’s “workmanship (poiema = masterpiece! ), created in Christ Jesus for good works, which God prepared beforehand, that we should walk in them,” our goal should be to daily seek to enter into His works, works that so to speak have already been “pre-paid” and “pre-pared” in Christ, even before the foundation of the world! (Eph 2:10–note, Eph 1:4–note, cp Heb 4:3–note, 1Cor 3:11) This great truth should relieve us of some of the pressure we often feel in evangelical Christendom to “perform” and should give us the freedom to learn to rest in what the Spirit of Christ can do through us when we are totally surrendered to His will. Yes, we will still have to “labor and strive” just as did Paul (Col 1:29–note), but now it is working out what the Spirit of Christ works in (Php 2:12–note, Php 2:13–note). Jesus Paid It All” from Passion 2006. This entry was posted in Bible Teachings, Inspirational Messages and tagged Christ, cross, Faith, God's plan, grace, heaven, it is finished, Jesus, Lutzer, paid in full, payment, ransom, redeemer, salvation, sin, spurgeon, walk, work. Bookmark the permalink.